Hello and Thank you for your time. 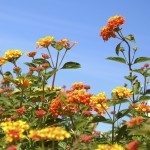 I have enjoyed doing a little research on your website about Lantana plants. I live Morristown TN, just outside of Knoxville. If I am not mistaken this is considered Zone 7A. I like the fact these plants are fast growers and understand they will need to be annuals for my zone. My questions are which varieties would be best for my area and would these types produce seeds if I want to try start from seeds the next year. The areas I will be planting will be full sun all day. I am a huge hummingbird fan and typically have a few each year. Thank you for your time and your web site is few well managed and easy to use. This species of plant will not likely have time to produce seeds in this area. I am not far from you, and I use these are very short lived perennials. The alternative is growing them inside. These do very well as houseplants. This would be a way that you could keep them around long enough for seeds. As far as what cultivar to choose... This will be completely up to you. None of them are suited for our area, so they will all have very similar results. Just find one that you like and start from there.